Previously released on compact disc by Silva Screen Records as part of a doubleheader with the original RE-ANIMATOR way back in the early 1990s and long out of print, Dragon’s Domain Records brings the BRIDE OF RE-ANIMATOR back to life again, newly remastered from the composer’s original elements by James Nelson at Digital Outland and with more music, along with liner notes written by author Randall Larson, with the participation of the composer. BRIDE OF RE-ANIMATOR is a limited edition release of 1000 units. 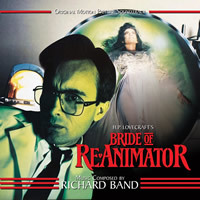 BRIDE OF RE-ANIMATOR will begin shipping on the week of May 4th, 2015 and can be ordered at www.buysoundtrax.com. The first 100 copies ordered trough the buysoundtrax.com website will be autographed by the composer at no extra charge.